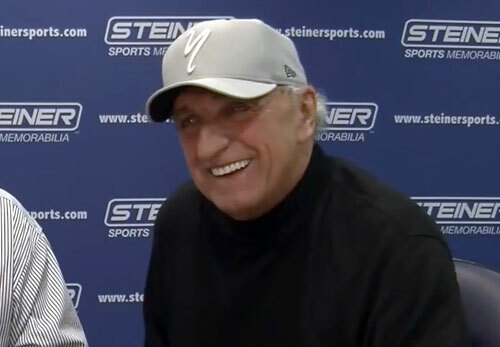 According to the Philadelphia Sportscard & Memorabilia Show website Pepitone signed with the Yankees in 1962 and then went on to win three Gold Gloves and even played center field after bad knees reduced Mickey Mantle’s mobility. Joe Pepitone is a former MLB first baseman and center fielder who played for the New York Yankees from 1962–1969, the Houston Astros in 1970, the Chicago Cubs from 1970–1973 and the Atlanta Braves in 1973. Pepitone is a three-time All-Star for 1963–1965 plus he is a three-time Gold Glove Award winner for 1965, 1966 and 1969. Sports Speakers 360 is a booking agent for pro athletes. If you would like to book Joe Pepitone for a speaking engagement, appearance or endorsement, contact a Joe Pepitone booking agent for fees at 1.855.303.5450.